The Lakota, a branch of the Sioux tribe, called them mako sica which can be translated as “land bad.” Since the Lakota believed that everything in the world was an expression of the deity Wakan Tanka, it’s unlikely they felt the Badlands were an evil place, but rather, a land that was not useful. What a name for a place full of dramatic scenery - a land rich in life and fossil history. Today, Badlands National Park, located in western South Dakota, presents us with a wide range of recreational aspects as well as a land of great archeological study. Where else could you see such vistas from a car window - and then in a relatively easy hike see bones of the ancestral horse, protruding naturally from a hillside. In Badlands, the Story Behind the Scenery, explore areas such as door trail, red shirt table, cedar pass and learn how they got their name. Learn about the archeological finds of fossils such as the discovery of Archaeotherium or as we call it the modern day boar. Along the way view wildlife such as mule deer, antelope, bison, black footed ferret and big horn sheep. 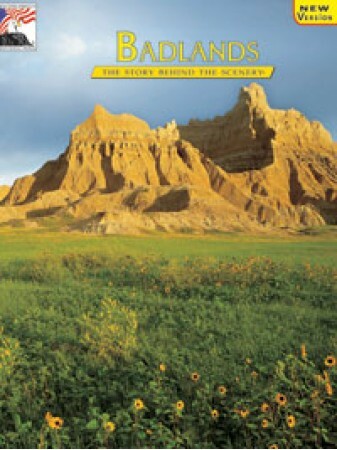 Add this beautiful book to your shopping cart now and come explore the unique landscape and the majestic sunsets found at Badlands National Park. 9x12, Paperback, 48 pages, 68 color photos & illustrations, & 2 maps.